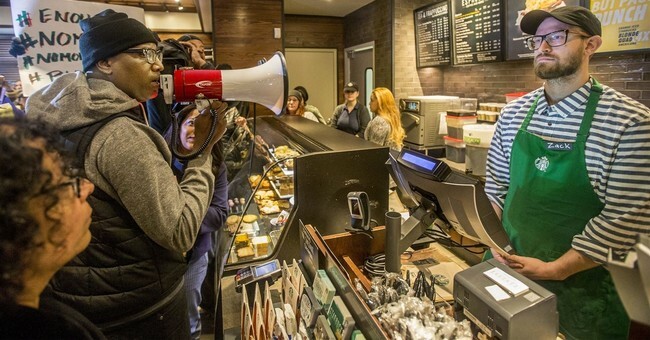 Starbucks announced Tuesday that it will be closing all of its more than 8,000 U.S. stores for an afternoon on May 29th so that their employees can participate in “racial bias training” following an incident in which two black men were arrested for trespassing after refusing to leave or buy anything while waiting for a friend in the store. Philadelphia Police Commissioner Richard Ross said police responded to a 911 call from Starbucks employees saying that the men were trespassing. An employee denied their request to use the restroom since they didn’t buy anything, citing company policy. Ross said officers "politely" asked the men to leave multiple times before the arrests. The men were later released when Starbucks decided not to prosecute. He said his officers "did absolutely nothing wrong." The incident was caught on video and caused Starbucks protests by Black Lives Matter and boycott threats. The Starbucks CEO met with the men who had been arrested Monday. According to the Starbucks statement, the curriculum for their employees will be developed with guidance from “national and local experts confronting racial bias,” including Bryan Stevenson, founder and executive director of the Equal Justice Initiative; Sherrilyn Ifill, president and director-counsel of the NAACP Legal Defense and Education Fund; Heather McGhee, president of Demos; former U.S. Attorney General Eric Holder; and Jonathan Greenblatt, CEO of the Anti-Defamation League.